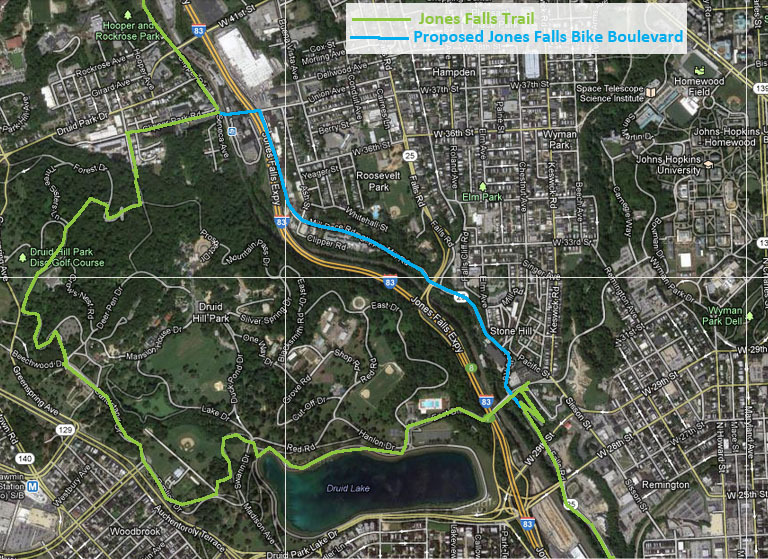 The Jones Falls Valley should be a top candidate for Baltimore’s next bicycle boulevard. In full disclosure, it is the author’s (and others) bicycle commute. Baltimore’s current and only bike boulevard is on Guilford Avenue between 33rd Street and Mt. Royal. A bicycle boulevard is a road shared by vehicles and bicycles, but with features that keep car speeds slow and create safe and comfortable bicycle conditions. A bicycle boulevard is not necessarily wide as the name implies, but does have the boulevard characteristics of being relatively short and not built for speed. A bicycle boulevard is the best prescription when you need cars to be able to share the road, but still want to emphasize bicycle traffic. This is a popular road for bicyclists (and joggers). The road is curvy, scenic, has few intersections and relatively little car traffic. The road is rural in its flavor despite traversing the center of Baltimore City. Appropriately, it has urban characteristics such as graffiti, an assortment of mill buildings, railroad tracks, and vestiges of Baltimore’s industrial past. It is an efficient stretch of road for bicyclists because it provides a relatively straight shot into midtown/downtown from the neighborhoods aligning the valley such as Hampden and Woodberry. It is not direct for most cars unless the trip originates in the valley. The problem with the status quo is that the road is dangerous. Cars often speed on the curvy road. As cars wheel around turns they may not be prepared for a bicyclist sharing the lane. Just as dangerous, cars widely pass bicyclists steering blindly into the oncoming lane trusting another car will not be coming around the bend in the opposite direction. Inevitably, there will be a head on collision and pinball effect of cars and bicycles. The outcome likely will not be a fender bender. Adding bike boulevard elements such as speed humps, shared lane markings, and other traffic calming would bring the risk of accidents down. These features are relatively low cost to implement because they can be added to the existing infrastructure. The Jones Falls valley is an increasingly popular place to live, work, and eat with redevelopment projects at Union Mill, Clipper Mill, Mill No. 1, and the Birroteca Restaurant. Creating a JFBB would make the valley a better recreational and commuting option for bicyclists (and joggers). The JFBB would be used to travel to new restaurants and apartments (that lack bountiful parking). It would increase public enjoyment of the river. The local roads in the valley do not need to be express. Baltimore should make this section of road its next bike boulevard.